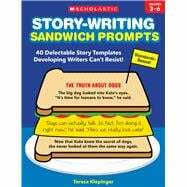 Story-Writing Sandwich Prompts 40 Delectable Story Templates Developing Writers Can’t Resist! Looking for a fresh way to motivate reluctant writers? Offer them a delectable sandwich writing prompt. These 40 super-fun reproducibles come “preloaded” with a story’s beginning, middle, or end—students supply the rest! When they do, they’ll sharpen important writing skills and simply have a blast. Written by a former teacher and professional storyteller. Content correlates with state standards. For use with Grades 3-6.